True Expression Photography Blog: Announcing: October Engagement Session Promotion! During 3 weekends in October, True Expression Photography is giving away free 45-minute engagement sessions! Bring your fiancé and meet me at Piedmont Park for a casual, fun engagement session with no obligation to buy. The Details: The 45-minute engagement session is completely free and includes one complementary 5x7 print. If you can’t decide on just one photo, you have the option of purchasing additional prints or digital files. Time slots may be reserved for Saturday October 4, Sunday October 12 or Saturday October 25 between 10:00 AM and 5:30 PM. 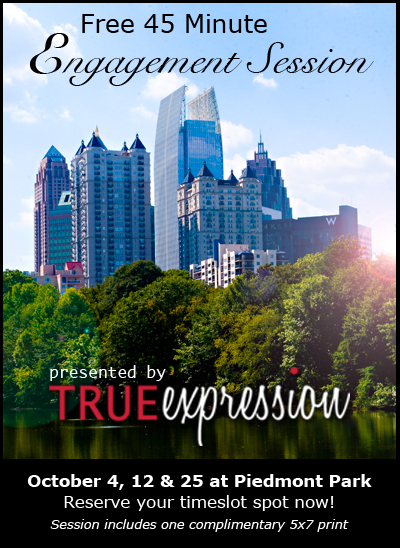 Sessions take place in beautiful Piedmont Park in the heart of midtown Atlanta. We will meet at the parking lot at Park Drive in Piedmont Park to start our session. As an added bonus, all couples are given a coupon for your choice of either a $200 print credit or a complementary wedding guest book featuring photos from the engagement session, redeemable if you choose to have True Expression Photography photograph your wedding. In addition, all Facebook fans will also receive 8 free wallet sized photos. So, if you haven’t already joined, click here to join now and be eligible for those extra photos.